In the last post, we saw a post WWI Arts and Crafts house in the Fessenden Park Extension neighborhood. A suggestion from social media brings us to this house, about 4 blocks away, in the original Fessenden Park development. It’s an interesting house. 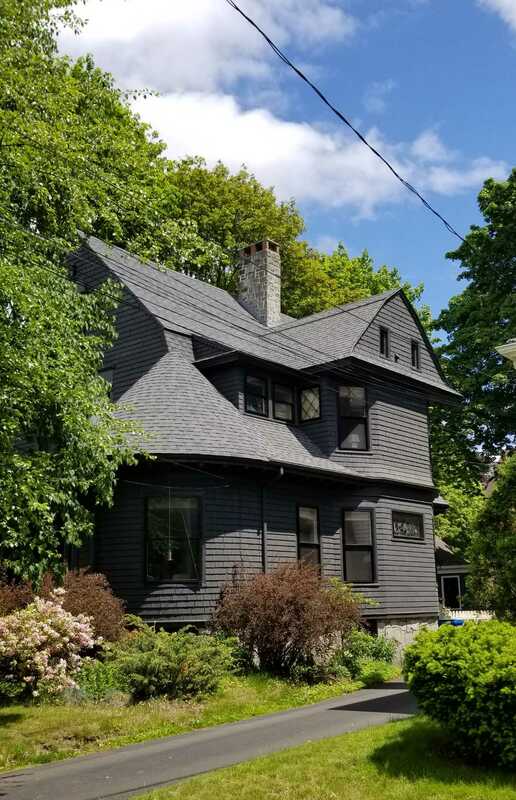 Mostly Queen Anne in style, it displays a touch of shingle style in the gambrel roof and simple use of the eponymous material on the second floor. The overall massing is narrow but deep to adapt to the site. Although there is no direct documentation for an architect, and there are some questionable details, I feel there is a major stylistic connection with this house and Fred Tompson’s contemporaneous house at 33 Carroll Street. 33 Carroll Street in 1924. Fessenden Park was the brainchild of Arthur E Marks and E (Eugene) Vinton Earle. They were the original planners of the ‘extension’ as well although the pair had gone their separate ways by the time that development was finally undertaken. The original Fessenden Park involved filling in the wedge between Deering and Brighton Avenues in the ‘old Deering Estate’. The plots were as uniform in width and depth as the area allowed. Detail from the original plan for Fessenden Park with our subject’s lot highlighted. 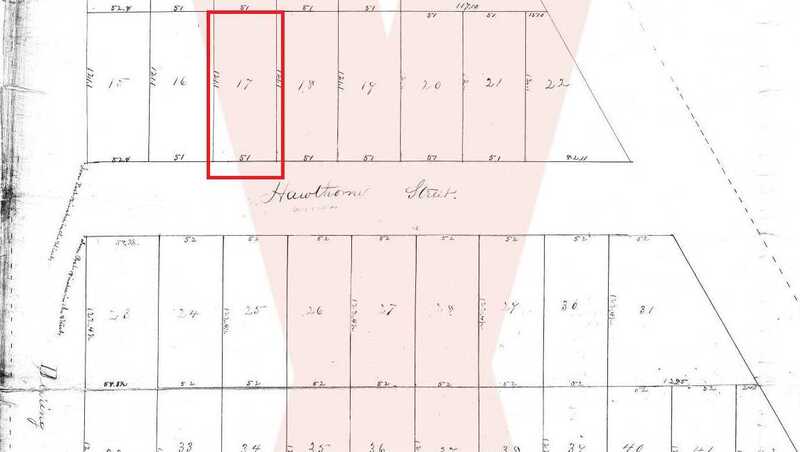 Note the originally proposed name for William Street was Hawthorne. The house sets rather deeply on its lot as do all the houses on the street. Although I have yet to find documentation, I think there was a setback requirement in the deeds as was the case for the ‘extension’. As the lots are fairly deep at 120 feet or so, there is still space for a decent back yard. A view of the Colonial Revival inspired panel work on the second floor. Note the diamond form window. Arthur Marks may have lived in #126 William Street for a brief period of time after he built it. He had done so on other houses. In 1900 he was living with his wife Lizzie and their son Homer in the once grand and now forlorn Queen Anne across the street at #129. A series of transactions in 1899 and 1902 detail a lease to purchase plan between the Marks and Joseph Peterson for #126. Joseph Peterson did not buy 126 William Street. In 1910, he was living on Kenilworth Street and our subject had been recently, September of 1909, purchased by Edwin C Jack. Edwin is a bit of a mystery. He was born in Portland but lived in Lewiston upto the time he bought our subject. His profession is unknown. The only census where it was noted was in 1910 and it’s illegible. In 1910 he purchased the lot next door at 134 William and the much larger colonial revival that is there. He sold our subject in 1914 & lived next door until his death from Bright’s Disease in 1917. I mentioned that I thought there were substantial stylistic links to Frederick Tompson in the design of 126 William Street. Those being the way the dormers on the northeast roof stand quite tall and extend deep into the roof line, the tight linear massing and the heavy gambrel roof compressing and restraining the structure both vertically and horizontally. But, here on the southwest side, it all falls apart. There is just too much going on here and it all doesn’t want to get along. We have gabels and bays smashed into multiple roof lines. Then there is the pointed roof on the first story extension. It is completely overpowered by the gable. If it was 2 stories it would better integrate. The lack of a window in the upper bay is odd. Perhaps it was omitted to create a ‘bed wall’. When Edwin Jack 126 William Street in 1914, the purchasers were William and Helen Todd. William was born in Newburyport to William and Phoebe Todd in 1881. Helen was born in Rockland in 1883 to David and Sarah Bird. William was an electrical engineer at the Portland Company and Helen was a school teacher. They had married in 1910. William graduated from MIT. His marriage to Helen is mentioned in the 1911 alumni review in which it says they were living in the triple decker at 222 Eastern Promenade. They would have one child, Barbara, who was born in 1917. In 1939 Barbara married Robert L Sprenkle who was the principal oboist for the Rochester (NY) Philharmonic and a professor at the Eastman School of Music. A note on the current color ‘scheme’. The use of one color for all the exterior surfaces is a very odd choice. It violates the current canon that houses of this era and style should have three, maybe four, colors. The body should be one color and the current color works quite well in that task. The trim should be a unique color as should the doors and windows. The tax photo shows this ‘tri-color style was how the house looked in the 20’s. Pity it has been lost. William Todd died in September of 1942. At that time Helen inherited the property. She would remain there until September of 1953 when she sold it to Harry and Vera Wheaton. I have not found any record of Helen’s death. Thee Wheatons owned the house until 1956 when it was sold to the Sax family where it would remain through deaths and divorces until 2004. This entry was posted in Architecture, Built on spec, By Request, Fessenden Park, Fred Tompson, Glimpses, History, Images, Off the peninsula, Queen Anne, Then & Now, William Street and tagged Architecture, Glimpses, History, images, Portland, Portland Maine, Queen Anne Style on June 26, 2018 by alewifecove.